Muzeum Sztuki in Lodz invites you to follow consecutive stages of Janek Simon’s project prepared in relation to the exhibition Workers Leaving the Workplace. On the coming Saturday, 31st July from 10 am. to 2 pm. at Rynek Balucki, Janek Simon will attempt to sell the goods he collected during his journey to Nigeria. He will try to use the methods of selling goods carried around in a bag or suitcase that constitutes an important, though informal, branch of Polish economy of the 1980s and in the beginning of the transformation period. New elements will be added to the artist’s installation at Muzeum Sztuki. Simon’s work began in Nigeria and is continued in Lodz. The work evolves in time and the constantly expanding installation at the Museum reflects its different stages. The artist explores the marginalized (from the point of view of the global line-up) informal local economies and their connections to the supranational flow of capital. In Lagos, the artist has visited the Alaba International Market. 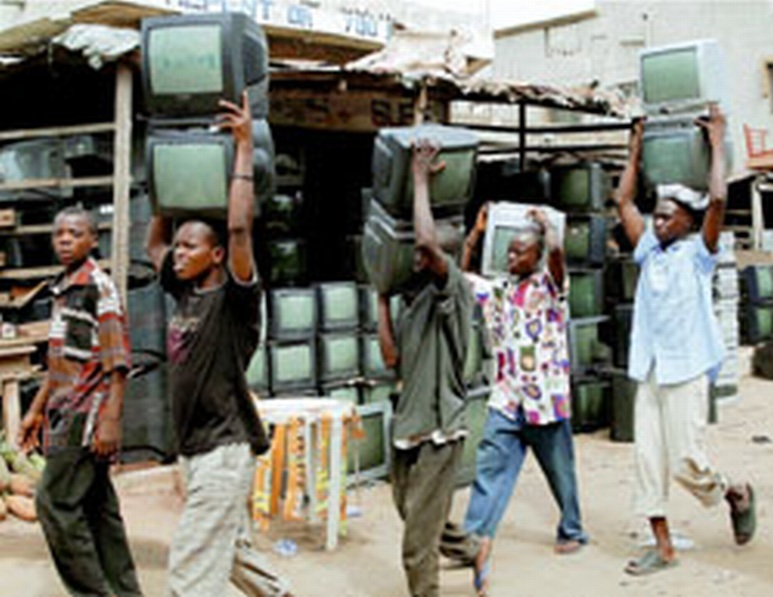 It is the largest market in Africa to which the used-up electronic equipment from Europe finds its way. It is further processed when it arrives: segregated, recycled, disassembled, sold or smelted to obtain raw materials. This grey area usually remains invisible to the countries exporting their garbage there. Alaba is the last, lowest level in the worldwide circulation of goods. The situation is represented in the metaphor “producers-consumers-reducers”. The economy of art is, in turn, symbolically inscribed near the top of this pyramid. In Alaba the artist gathered mostly used portable CD players, and in Yaba Market, located in the suburbs of Lagos, he bought cheap Chinese goods manufactured especially for African markets. The next place Janek Simon visited was Surulere, the center of local film production known as Nollywood, and Voodoo from there the artist has brought accessories connected with these branches of production.